Experience a fall vacation of reds, oranges, golds, and greens that tint the maple forests in the Western Upper Peninsula from mid-September to early October. Ninety percent of the area is forest covered, so your eyes will have plenty to take in. The colors outlined by the mountains, bluffs, and lakes form postcards around every corner. There is nothing that can match one of our lakes or waterfalls wrapped in the brilliant colors of Autumn. Come see the burst of color for yourself or take a friend along for the company. 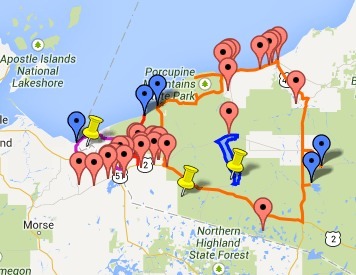 Click here for updated reports on the progress of the color in the Western Upper Peninsula. Color changes earliest in the inland regions. The season is a little bit later along the coast of Lake Superior. Copper Peak Ski Jump and Adventure Ride – Western U.P.